Horizontal Alignment of the Menu : Defines the horizontal alignment of the menu (Left, Center, Right). Vertical Alignment of the items : Defines the vertical alignment of the menu items (Top, Center, Bottom). Horizontal Alignment of the Items : Defines the horizontal alignment of the menu items (Left, Center, Right). Toolbar Horizontal Alignment : Defines the horizontal alignment of the toolbar items (Left, Center, Right). Friendly URL : Allows to define a name for the URL that’s going to be called by the application. The characters allowed in the URL are(a-z, A-Z, 0-9). The Friendly URL can be informed on the initial screen of the project, where the applications are listed, on the “Friendly URL” column. Menu Width : Defines the width of the menu in pixels or percentage. Menu Height : Defines the height of the menu in pixels or percentage. Iframe Width : Defines the width of the Iframe (Where the applications will open in) in pixels or percentage. 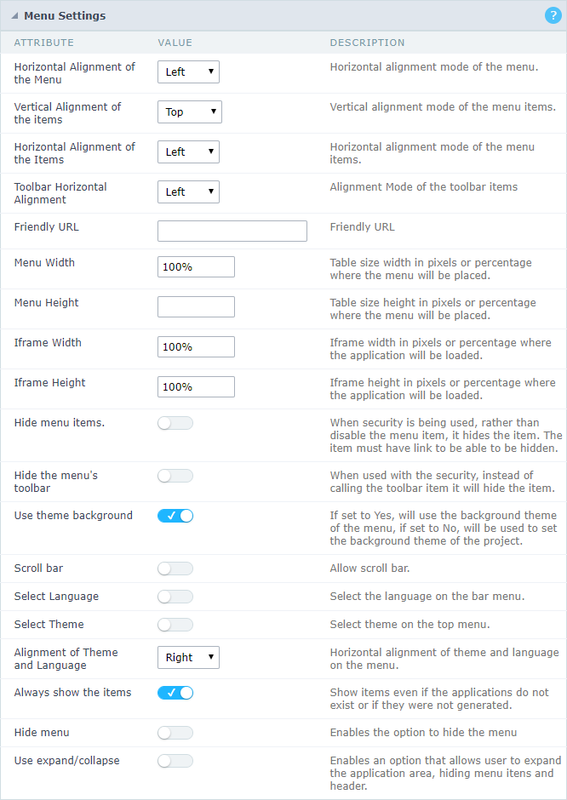 Iframe Height : Defines the height of the Iframe (Where the applications will open in) in pixels or percentage. Hide menu items : When enabled and used with the security module, it’ll hide the items that the user doesn’t have permission to access, instead of only disabling them. Hide the menu’s toolbar : When enabled and used with the security module, it’ll hide the toolbar that the user doesn’t have permission to access, instead of only disabling them. Use theme background : If defined as Yes, it’ll use the background theme of the menu, in case it’s defined as No, it’ll use the background defined in the project. Scroll bar : Enables the scroll bar in the Iframe. Select Language : Allows to select the language in the menu bar. Select Theme : Allows to select the theme in the menu bar. Alignment of Theme and Language : Defines the horizontal alignment of the language and theme combo boxes. Always show the items : Displays the application items, even though they don’t exist, or haven’t been generated yet. Hide menu : Enables the option to hide the menu. Open items in a tab : When enabled, the items will always open as tabs in a horizontal bar beneath the menu. Navigating through Applications with tabs. 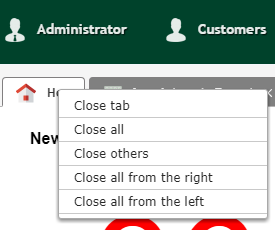 Tab context menu : Allows you to manage the open tabs. Application with a tab context. Minimum tab width : Allows to inform the min width of all the tabs. Maximum tab width : Allows to inform the max width of all the tabs. 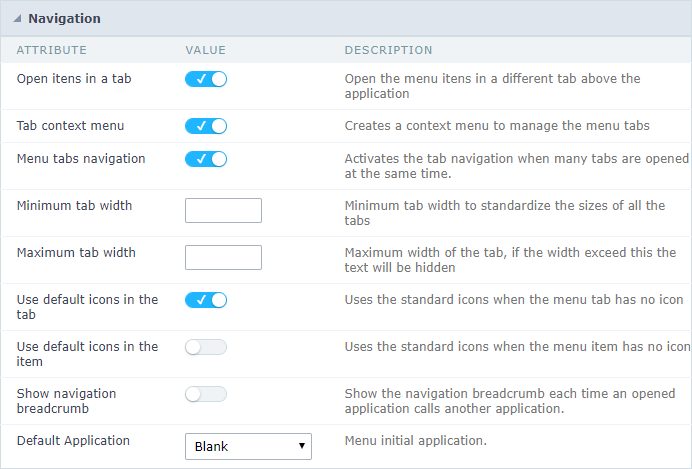 Show navigation breadcrumb : Displays the path containing the application in the tab. Navigation path Display in the Application. Use default icons in the item : When enabled, this option displays the standard icons for each item. Use default icons in the tab : When enabled, this option displays the standard icons for each tab. Default Application : Select a default application that’s going to be initiated when the menu opens. Show initial app as tab : Allows to open the default application in a tab. Hide menu : Enables the option to hide menu when view from a mobile device. Menu’s initial mode : Inform the initial mode of the menu, otherwise it’ll always be visible. Hide menu by clicking an item : When enabled, defines that when an item is clicked it’ll hide the menu. Float menu : Hides the icon to open the menu or always displays it.